Hello, Somerset: Your awnings are here, courtesy Patio Shades Retractable Awnings! PatioShades is the premier on-line provider of max-quality, exquisite and highly functional awnings, arbors, shades, pergolas, temporary roofs, window and door coverings and all manner of canopies. From our Bridgewater, NJ, office location we serve all of New Jersey, catering to the needs and demands of homeowners and businessowners alike. When your storefront wants to welcome more customers, or your apartment building needs a more welcoming atmosphere, or your office complex should have an extra added touch, these are all good reasons to consult the Awnings Architect at PatioShadesRetractableAwnings.com. That’s what we call our helpful on-line feature that helps you coordinate and choose your customized awning purchase, making absolutely certain we know what you want and you know what you’re getting. Here’s the journey that your custom motorized or mechanical awning takes to arrive atop your door or window: First you select the colors, style, materials and functionality of your new awning by using our Awnings Architect here at www.PatioShadesAwnings.com or by calling 908-259-4969 locally around Somerset or elsewhere in New Jersey (1-844-NU-PATIO elsewhere in the United States or Canada). 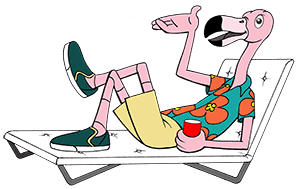 Then, you give us the right measurements for your custom awning – Frank the Flamingo, our friendly on-line tall pink bird, helps you with that in the Measurement section of our Internet site (or, also, give us a call or an e-mail to [email protected]). Then, we go to work. In partnership with Italian companies recognized the world over for being the consistent manufacturers of top-quality, high-end, reliable, durable and beautiful awnings and protective shading products, Patio Shades Retractable Awnings has our European partners ship your custom-built materials to our plant in Chester, New York, USA, where our contractors put their expertise to good use, hand-crafting your brand new awning and preparing it for final installation on your NJ home or property. If you are a do-it-yourselfer and in the market for a motorized awning, you may be eligible to receive, totally free and complimentary from Patio Shades, a wireless motion detector which will automatically roll up your motorized awning in the event of foul weather running afoot and threatening to blow down and damage your precious awning feature. Inquire with us for details. For all of the year 2016, PatioShades is offering on-line purchasers a special 20 percent discount for awnings and other orders which make use of the special savings code. See the graphic image rotator on the main page of PatioShadesAwnings.com for the code. Installation is a snap, and you can do it yourself if you so choose. If you prefer not to, give us a call and we will put you in touch of a local professional trained and expert at assisting you with the installation of your new awning from PatioShades. Patio Shades Retractable Awnings is Hand-Crafted, Above The Rest™ because we offer the best selection of the best products, providing the best service and dealing with the best manufacturers and contract installers…and we are where Somerset goes for awnings.